Previous PostXbox 360 Slim PortableNext PostXbox 360 Slim Portable with New Colors! Actually Kyosho, a narrower field of view would have been better. It would have kept objects closer to actual size. The screen being small is part of the equation too. Awesome!!!! I’m wondering what camera did you use? Now you just need to add a front camera, face recognition and transform the portal according to the position of the nearest face. Where does one get the plans for that awesome portable workbench he pulled out in Episode 4??? 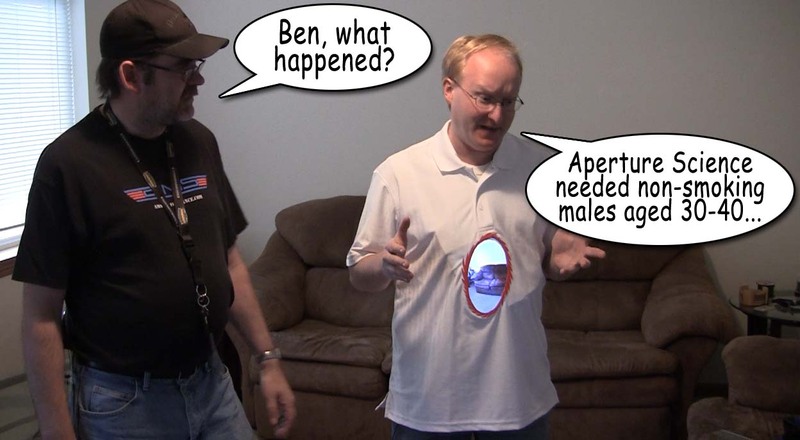 Ben heck, you always impress me with your projects, but this one is nothing special. Ive seen costumes like this one before. Ive seen one the looked like a big shotgun hole in a guys chest. Still a neat idea. but nothing special. Yeah, I’m not sure what I was thinking. I’d been up over 24 hours and my brain was fried. 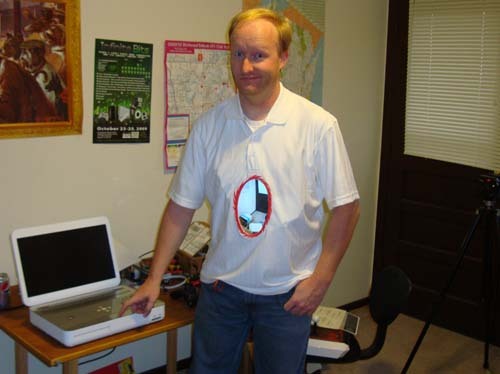 Pingback: A see-through t-shirt, aka the geekiest/best halloween costume ever. I think is Cool. Some how it reflects what is behind you. Keep inventing you are good. The screen stands out under the shirt a bit too much. Maybe using some foam around the screen to make it an oval and then padding it all with another layer of foam all over the front side of the shirt would take care of that problem. Anyway, how does the back look? There must be smaller webcam type cameras out there that won’t protrude so much (if you don’t care about the image quality), and if you sit back on a chair won’t go into your spine. Great stuff, though a bit early for the technology. Rollable screens and totally flat cameras are a bit out of the DIY tinker’s price-range I suppose. I built something similar using two 7″ lcd’s and two pin hole cameras. I drilled out the center of the buttons on a button up shirt and mounted the pinhole camera behind it. Same for the back (had to add a button). 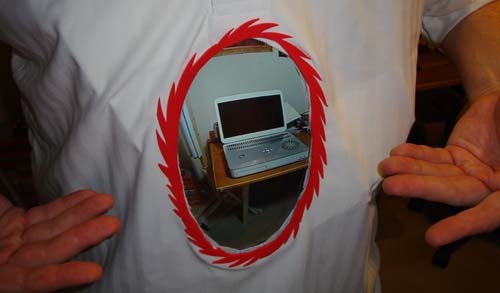 Protected the lcd via some plastic binder inserts, added blood, and walla gun shot wound Halloween costume. Won 1st place in a local costume contest. No crazy modding, everything ran off 12Volts so I just grabbed two 12 volt lead acid batteries and stuffed them in my pockets. Ran the camera facing the rear to the front lcd and vice versa. someone pointed me to your website as you designed a lefty controller, well” if I had a bunch of money I would too..
I’m interested in a lefty X360 controller, soo here’s my story. My son has Porencephaly ( missing a golf ball size peice of the left side of his brain) he has no fine motor control of his right hand, and can barely hold the right-side of the controller with his right hand. So he plays lefty, palming the left stick mostly, using thumb on right stick and shooting/nading etc.. with his left fingers. He’s been playing games since he could hold a controller, my way of helping him with his dexterity of his left and right hands. and if you watch his face closely when he talks, his rightside doesn’t move quite the same as his left. he does very well, plays many different types of games, COD, HALO, NBA, NFL, MLB, Racing, etc. Pingback: What props could use an old Touch Screen?